The holiday season is greatly anticipated in my home. I love decorating my tree with my collection of glass ornaments and baking my favorite treats such as my golden fruit cake. To add to the festivities there are always new Christmas themed books available for those who love to escape into another holiday wonderland. If, that happens to be a Jane Austen-inspired Christmas, then so much the better. As, the newly engaged Georgiana Darcy travels home with her brother by carriage from London to Pemberley to celebrate the holiday with his family, she reflects upon her safe choice of fiancé, Mr. Moresby, and the man that she passed by, the dashing but dangerous Captain Daunton. Safe is a place that she craves to be after her near fatal elopement five years ago with George Wickham, the son of her deceased father’s steward. Wickham had later proved that he was indeed a scheming cad when he had eloped with Mr. Darcy’s wife Elizabeth’s younger sister Lydia. Mr. Moresby’s prudential views might be stifling, but he was a man of rank and high regard, enough of a catch to attract the attention of Caroline Bingley, who is bitter over his choice of bride. When she learns from her maid of Georgiana’s almost elopement from Ramsgate at age fifteen, she uses this scandalous information to drive a wedge between Mr. Moresby and his new fiancé. Happily, among the guest attending the holiday festivities is Colonel Giles Hawkins, an old friend of Mr. Darcy who befriends the distressed Miss Darcy and offers a surprising conclusion to the story. Aston has brought together all the key players from Austen’s classic tale: Mr. & Mrs. Darcy. Mr. & Mrs. Bingley, Georgiana Darcy, Caroline Bingley and others and introduced new characters in this delightful, heart warming continuation. She sets the season with all the trimmings and traditions during the Regency-era: yule logs, garland, mulled wine and fruitcake, adding in an engaging story with a whiff of scandal, heartbreak and joyful family celebration. This irresistible Christmas confection should be the star on your holiday book tree. I recommend it highly. I just downloaded my copy yesterday! Looking fwd to reading it this Chrostmas season. Great review. Thanks so much for finding this. I despaired of her ever writing another Austen book again. Ella – did you know that Elizabeth was a contributor to my Austen-inspired anthology Jane Austen Made Me Do It? Indeed. Her story is entitled: “The Ghostwriter” and it is charming. I hope you have a chance to read it. I will be downloading this book to my Kindle just after I head up to bed. I’m also going to check on whether or not I’ve read all of the other 3 books you mentioned. I think so but if I missed one I’ve got to rectify that! Thanks for posting, Laurel Ann! I’ll also mention, just for those who’ve already read the books listed here, that Lauren Willig has written a series of books that takes place during the regency time and has two books, one of both maybe actually novella, that take place at Christmas time. Ivy and Intrigue and Mischief of the Mistletoe. 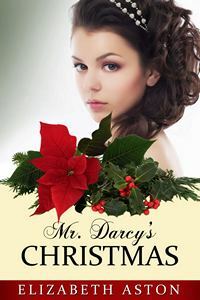 They are entertaining, too, if you, like me, want to gobble up Christmas regency books. My favorites are the ones about the Darcy’s but after you read those and are craving something more, you might like to try these two. I adored this book, mostly because of the hero Reginald “Turnip” Fitzhugh and Jane Austen as a character! Thanks for reminding me. How could I forget it??? I’ve made no secret of the fact that I’m a sentimental sucker for a good Christmas romance. So, on the strength of your review and your recommendation, Laurel Ann, I’m reading this one immediately. The Kindle price is quite reasonable and I’ve never yet read anything by Elizabeth Ashton so this Christmas season is an appropriate time to begin. I’m also one of Lauren Willig’s biggest fans and her Mischief of the Mistletoe was one of my all-time favorite Christmas stories. It was also my entrance into her Pink Carnation romantic espionage series. I’ve read’em all and loved them all. I read it yesterday after a starting the holiday decorating! Perfect read for a wet, blustery day. A yummy confection!